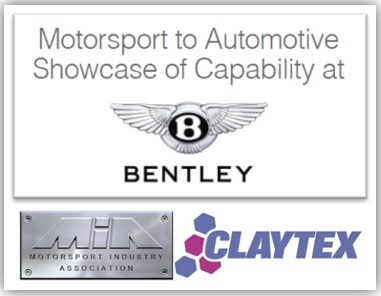 Claytex will be exhibiting at the MIA’s (Motorsport Industry Association) Motorsport to Automotive Showcase of Capability event at Bentley. Bentley Motors is the world’s most sought after luxury car brand. Headquartered in Crewe, Bentley cars are designed, engineered and hand-crafted by around 4,000 dedicated colleagues. Fine craftsmanship and engineering expertise have been passed through generations which means that every car is created, not merely assembled. This is made apparent in the company’s models; The Continental, Flying Spur, Mulsanne and Bentayga which combine both luxury with performance. We would like to invite all the engineers at Bentley to attend this event where a number of MIA members will be showcasing their engineering capabilities. If you have any questions or would like to schedule a meeting with us during the event, please do not hesitate to contact us.